These just may be too much for even the sweetest of you sweet-toothers. Since chowing down on the mixing spoon, I haven't been able to touch another one. Oh the sugar rush! 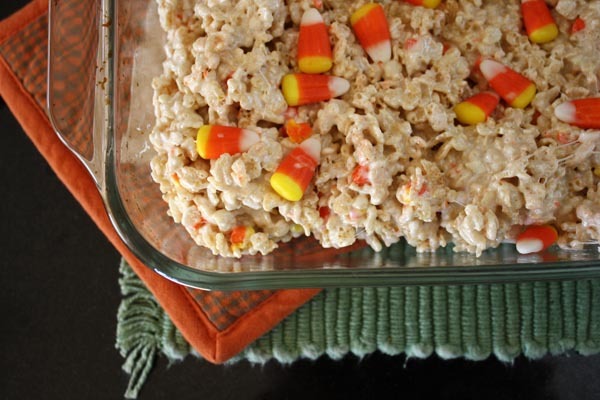 but if you like candy corn, these will totally make your day! First off, chop your butter up for easier melting. Your kidlet can do this with a blunt or plastic knife. Add to your big pan on low heat and stir, stir, stir away. You will want the butter to froth up and then brown a bit for an extra kick of flavor. When it browns, toss in a small bit of sea or kosher salt. while the butter is melting, pass off the wax butter wrapper (or small square of wax paper) to your tot and have them coat the inside of the baking dish. 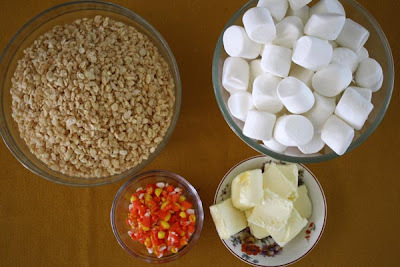 Once the butter is all melted, add your marshmallows and stir away. Mini marshmallows melt faster but large mallows look happier. You decide. I also have to be honest and tell you I added about 13oz of marshmallows as I like my treats on the gooey side. 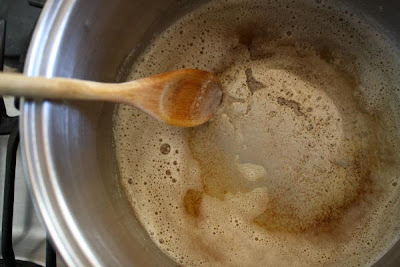 Stir until all your lumps are out or if you are impatient like me, allow for a few lumps. 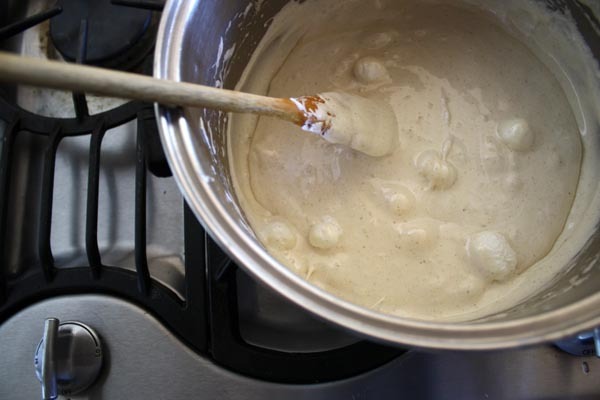 Pour cereal into melty marshmallow mix and give a stir. Before your cereal can soak up all the gooey goodness, make sure to plop your chopped candy corn into the fray. 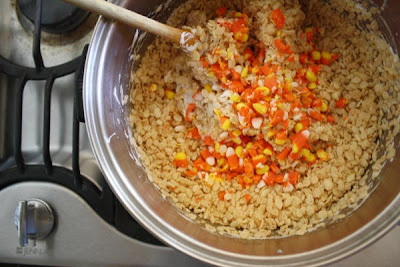 Chopping the candy corn allows for more biteability plus it melts a little so that the flavor can be detected throughout your final squares. Scoop mixture out into buttered dish and push down with the spoon. If your mixture is too gooey you can use wax paper to flatten it down though I find that if it is too gooey for he hands it will prolly stick to the paper as well (unless of course, there is a non-sticky side, which there probably is but I just can't seem to figure it out). 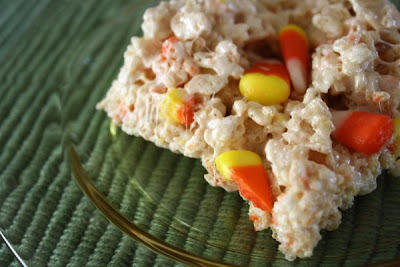 Press a few whole pieces of candy corn to the top for garnish and fun. Allow to set for a moment or too and then slice it all up and serve. You may want to serve it up with a cold glass of your preferred milk beverage. These squares are sweeter than sweet. A little goes a long way so you may wish to cut itty bitty squares. Wow! That sends me into sugar overload just reading about it! I do love me some candy corn and rice crispie treats, though! Make Paper Plate Calaveras Masks! DIY calaca for Dia de los Muertos!